Native American Heritage Month has been observed in November since 1990, with other, briefer, observations being designated in earlier years. We invite all visitors to explore The Arkansas Archeological Survey’s website, to learn how our archeological research contributes to knowledge about the history of American Indians. We’d especially like to feature our two websites, “Indians in Arkansas” and “Bluff Shelters of the Arkansas Ozarks,” offering detailed explorations combining archeology and oral history. Arkansas Native Americans is a permanent installation located on the mezzanine level of the Union building on the University of Arkansas campus. The idea for the exhibit originated in the Office of Vice Chancellor for Student Affairs as a way to honor the campus Native American community. 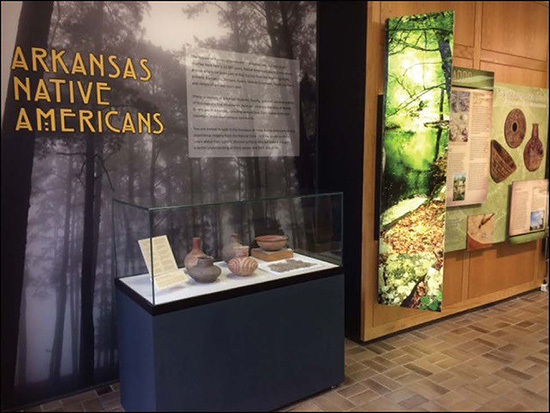 The lavishly illustrated exhibit was fabricated by Todd and Tracy Johnson (Circa Digital Group), and features information contributed by Caddos, Osages, Quapaws, and Tunicas—all indigenous to Arkansas—along with a summary of early 19th century Trail of Tears removals featuring Cherokee and Choctaw experiences. University of Arkansas Museum staff periodically incorporate new display items in two accompanying exhibit cases. The campus community and general public are invited to visit the exhibit during Native American Heritage Month, and throughout the year.